Like so many of the houses on this tree-lined avenue in the Glebe, the red-brick corner house has a certain stately air when viewed from the outside. Surrounded by tidy flowerbeds, with elegant wide flagstone steps to the front door, it has a timeless feel. However, appearances can be deceiving. The home of Emily and David Segal and their three young children is anything but traditional. 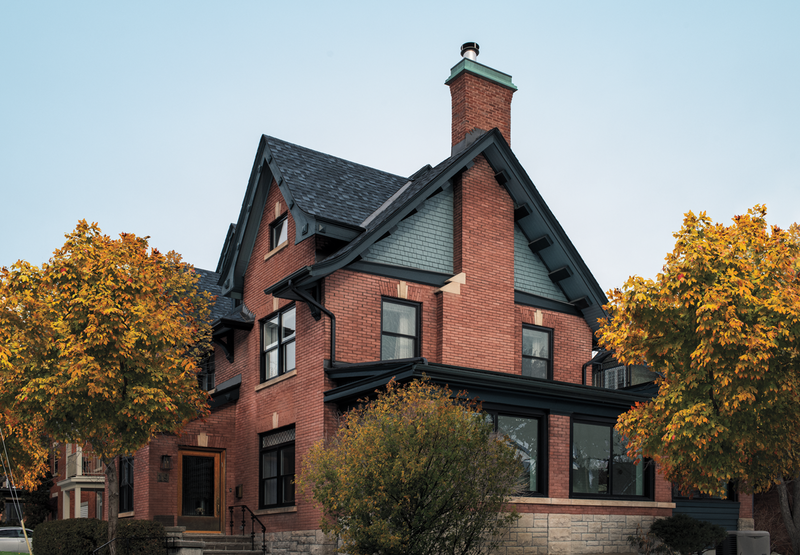 Rather, it’s an inspired renovation to create a modern home that will stand the test of time. 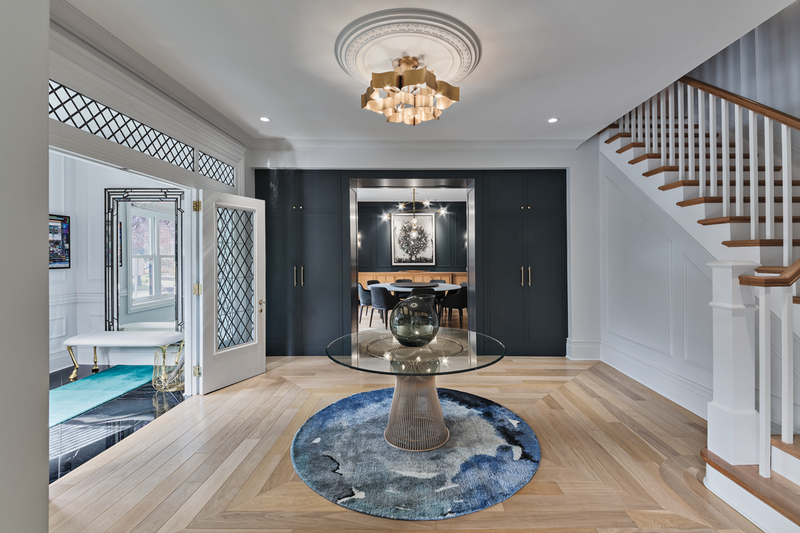 Where previously the century-old house had been all dark beams and wood panelling anchored by a heavy wooden staircase, now it’s bright, light, and contemporary. Painted from top to bottom in a silvery-white tone, there are moody touches: a sophisticated dark blue-grey found in David’s office wallpaper by Hygge and West, for example, and the panelled walls in the dining room. When the Segals bought the house, Emily admits, it was in great shape — it just wasn’t the house they really wanted. “It felt rather like something from the set of Downton Abbey,” she recalls, “and was a mix of styles and smaller rooms tied together by history.” So they started with small changes but eventually undertook a very large renovation. Maintaining that spirit meant salvaging leaded windows and doors where possible and incorporating them in unique ways — one pair, from a hutch previously in the kitchen, now fronts a bookcase in David’s office. Bright custom panels have replaced the dark, dated panelling. And the attention to finishes and detail hearkens back to the days of lumber barons, when fine millwork was a hallmark of quality. 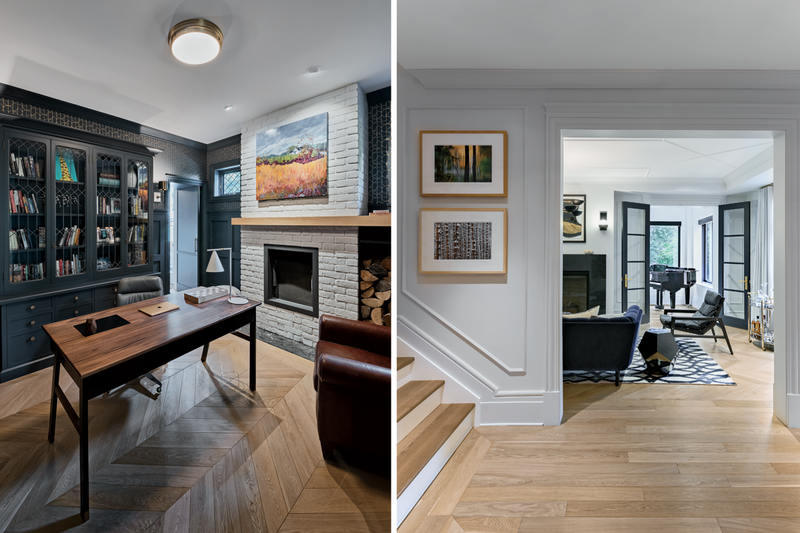 The new floor plan moved a staircase and reconfigured the space to create a home with an airy, open feel. But this is not an open-concept house; rooms remain distinct. Continuity on the main floor was achieved by raising the floor between the sunroom and living room; wide plank flooring, in white oak set in a chevron across the whole space, ties the rooms together. Only the hall is not chevron, but rather laid in a picture-frame pattern. “David’s interest was always the layout,” recalls Emily, “because he’s an ambulator. It was important to give him a place to do his ambulating.” Her husband, founder and former owner of Davids Tea, is now busy with Mad Radish, which has three locations in Ottawa and recently launched in Toronto. He likes to walk while he thinks. To this end, his office needed an in and an out, so the designers hid a secret door in the wall panelling in the kitchen. With the addition of this door, the house makes one large linked circuit. Once walls, floors, and stairs were in place, it came time to turn to finishes and decor. 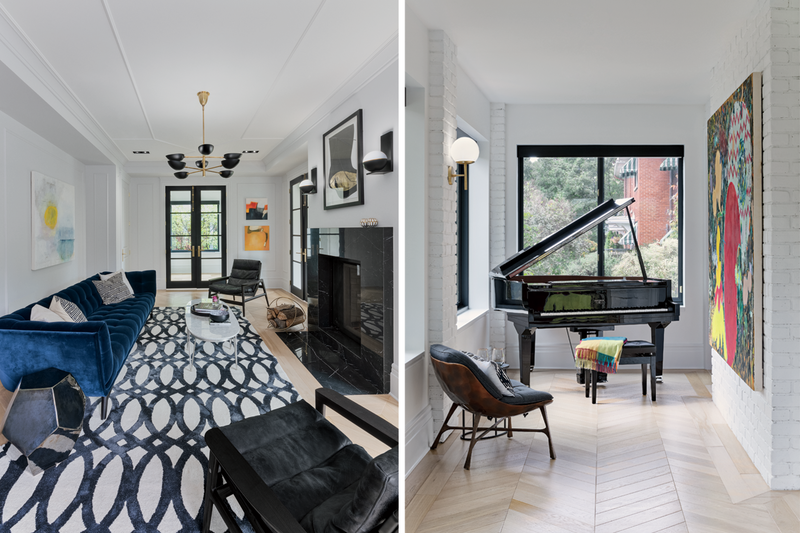 Emily created a Pinterest mood board for the O’Keefe Fiorenza team to work with, “and after that, we had such good synergy that choosing the elements was very iterative and a quick process,” says Fiorenza. 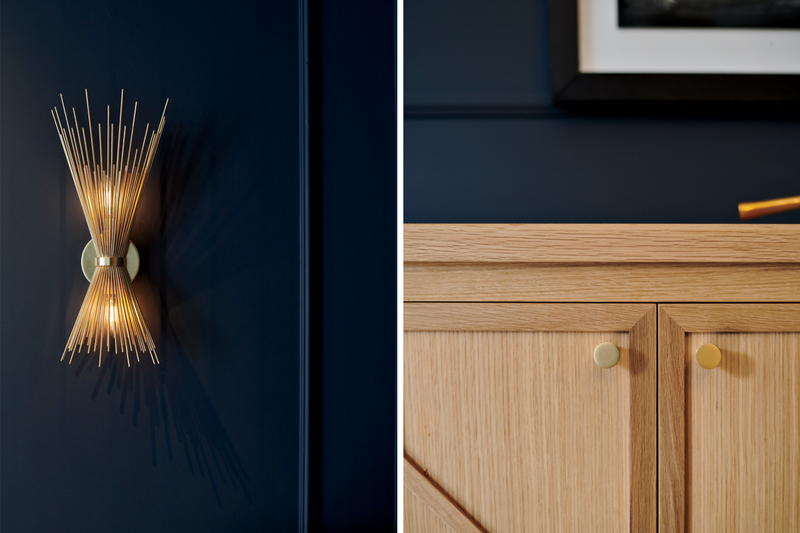 Speed aside, Emily admits to a love of gold and navy, which is reflected in the dark, moody tones and brushed-gold fixtures and fittings. 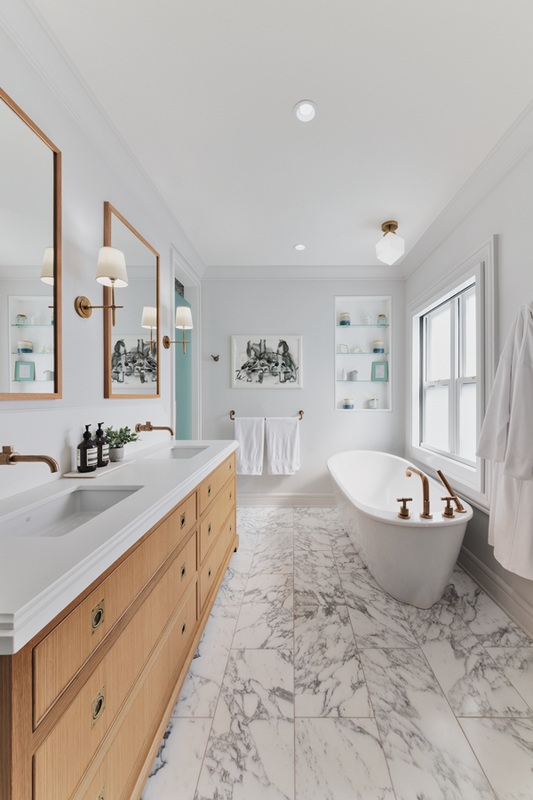 The palette is limited to just five colours on the ground floor — the dark and moody grey-blue, white found in marble accents and tiling in the powder room, black, gold, and the natural tone of white oak. All combine to create a calmly classic contemporary feel. Typically, lighting is one of the biggest challenges when designing a home. 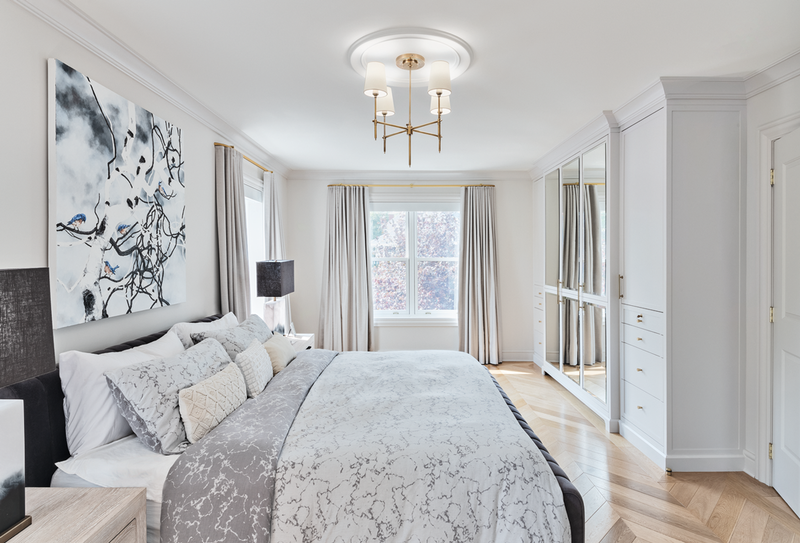 But here, the process was smooth, and light fixtures in this house make a bold statement. Several give a nod to the globe street lamps that line many residential neighbourhoods, at once rooting the house in its Ottawa context and bringing the outside in. “I feel like the lights are the jewellery for the house,” says Emily. The Segals brought just one piece of furniture from their previous home: David’s perfect-for-reading leather chair that now sits in his office beside a log fireplace. 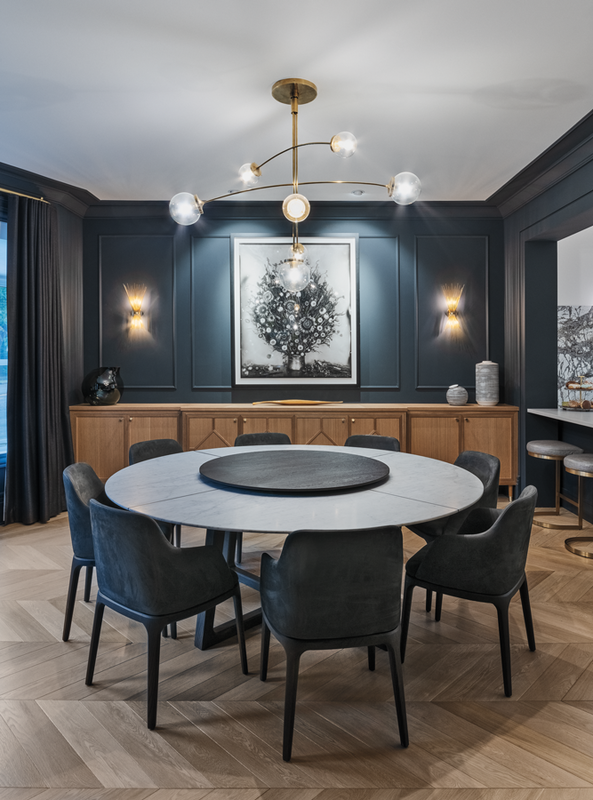 Elsewhere, the couple invested in the largest dining table they could find — a round from Poliform that seats eight — and a stunning white oak sideboard with gold feet made by local craftsman Sven Pavey. Children’s bedrooms on the second floor are light and airy in tones of soft blush for the two girls, grey and silver for the boy. The master bedroom boasts a large sundeck, which has been creatively shielded from neighbours’ eyes by a laser-cut, powder-coated steel screen. It was made in Toronto by Emily’s father, who delivered and installed it himself. The couple opened the third floor to the rafters, gaining valuable volume. 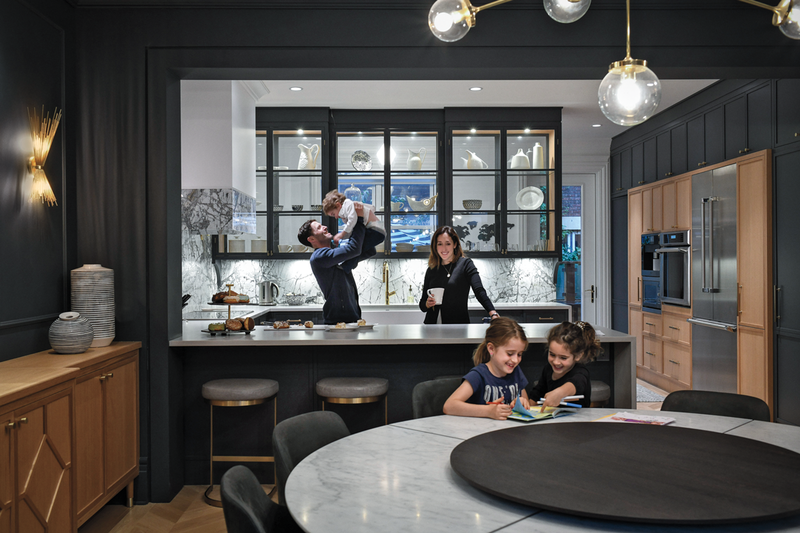 The extra space allowed them to create a guest suite, a desk nook for Emily, and a light-flooded window seat, as well as a dedicated play space for adults. The stunning black walnut table-tennis table takes centre stage. The first furniture purchase for the house, it was made in California by Sean Woolsey Studio and came with a rigid perforated metal net. It’s as much a work of art as a games table, but Emily’s dad does not approve. The former vice-president of the Ontario Table Tennis Association is on the cusp of induction to a regional table tennis hall of fame in Portugal. When he comes to visit, he brings his own net and paddles. The Segals turned to the Ottawa Art Gallery for advice with artwork selections. Their collection now includes works by Adrienne Herron, Joyce Westrop, and Karen Whyte. They have also commissioned a piece by local photographer Whitney Lewis-Smith.